Happy Fourth of July 2018, #Raleigh! See tweet by @metroscenes of fireworks with the Raleigh skyline on Twitter. The lighting of the RBC Plaza is a symbol of the progress of the revitalization of downtown Raleigh. Ten years have gone by and the 33-story PNC Plaza is still the tallest building around. That could mean a number of things. Some of us may measure progress with height and flash while others with amenities and vibrancy. A lot has happened over the last ten years in downtown Raleigh including a great recession that scrapped plenty of projects that may have joined PNC Plaza’s height. 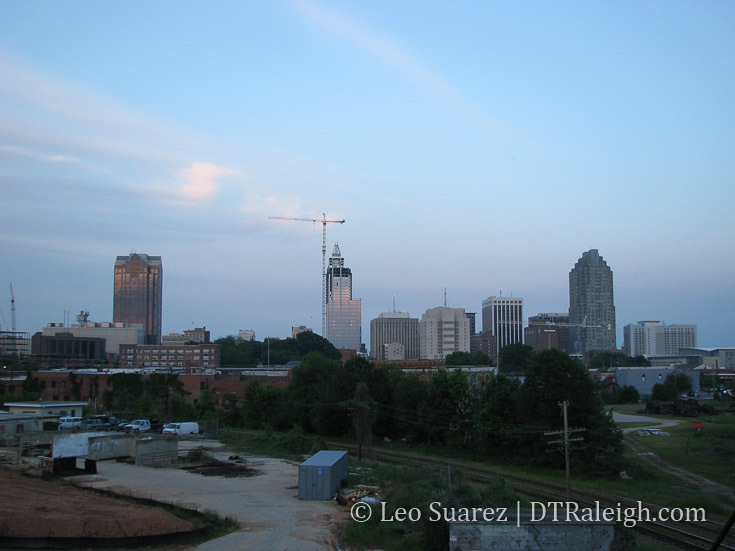 A wave of apartments has crashed in downtown Raleigh since then and PNC Plaza remains the only building with residential units at that height. You could say PNC Plaza was the end of an era. RBC Plaza under construction seen from the Boylan Bridge. May 2008. While height above 30 floors doesn’t seem to be something popping up in and around downtown Raleigh since the completion of PNC Plaza, downtown continues to deliver new buildings that are filling in around her. People keep moving here and new businesses continue to open up here. I’d like to think that the PNC Plaza spire lighting up ten years ago wasn’t exactly a symbol of our revitalization but rather the homing beacon for future newcomers. It’s also a welcome home sign to long-term residents journeying back. It may be hard to spot but you can see it with the right window seat when landing at RDU at night. It’s become a part of our home. Here’s hoping we never miss a night with that light off. 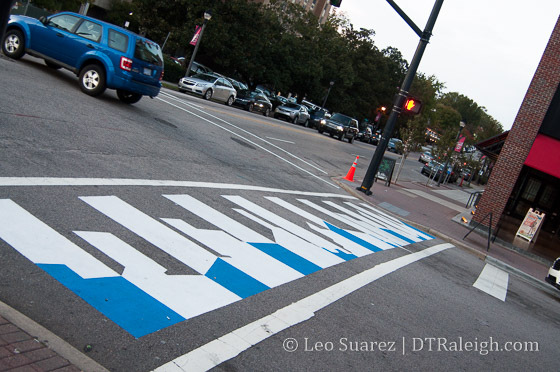 Come discuss this and other downtown Raleigh-related topics on the DTRaleigh community. If you spend time in downtown Raleigh, it’s not hard to run into historic photos of our city. Restaurants, shops, and offices have been getting photos from the State Archives office and framing them as part of their renovations and presence throughout the growing times of downtown Raleigh. These photos are maintained, labeled, and identified by the good folks at the State Archives office. A local star among these efforts is Karl Larson who has done great work in helping to identify photos and where they may come from. His detective work is top notch and this new Indiegogo campaign was an easy one for me. I encourage you to take a look and consider it if this kind of work is important to you. The hours for the trucks to be here are between 10am and 3pm. On First Fridays, they are allowed out there until 8pm. The food truck debate really does put our public spaces, more specifically the public on-street parking spaces, into view. Parking, and the threat of reducing it, gets emotions running. In my opinion, these designated food truck areas provide a greater public good then a few more parking spaces. They support a diverse of uses, especially a use that provides to pedestrians in an urban area rather than vehicles in an urban area. Skepticism over food trucks isn’t new in Raleigh. The City of Raleigh Museum has a good blog post about the debate over ice cream trucks in Raleigh during the 1960s. 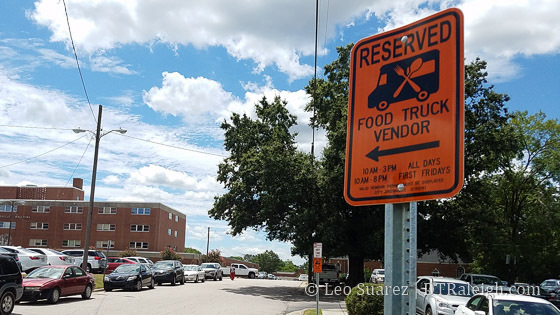 Are food trucks really an issue or is Raleigh just being Raleigh? Hopefully, the pilot program goes off well and more food truck areas can be added to the list. 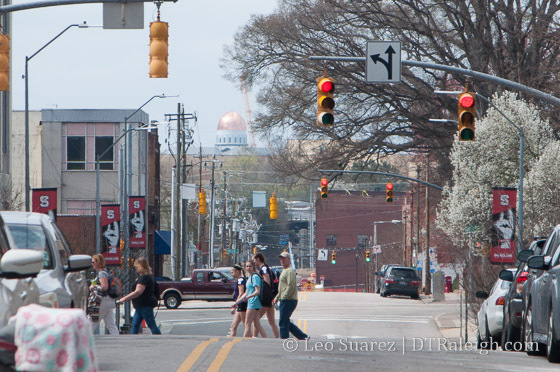 I was walking down Fayetteville Street recently on a gorgeous Spring afternoon. On this particular day, a Saturday with no major events taking place, people were wandering the sidewalks enjoying the same comfortable weather. I’ve done the walk thousands of times but it was when I noticed a small, new detail that refreshed my perspective and sense of where I was just a tiny, little bit more. I was crossing Martin Street and to my right, way in the distance, I could see the newly placed dome of the large Catholic church being built to the west of downtown. For a quick second, I had a new perspective of where downtown was located in relation to other areas of my city. This has nothing to do with the church itself, I’m not a very religious person. It’s the idea of being able to view, in the distance, other parts of our city that gave me a sense of place in relation to other places in Raleigh. The same could be said of the towers in North Hills as you cross Dawson Street. When walking, I always look north up Dawson and can see where North Hills is located. 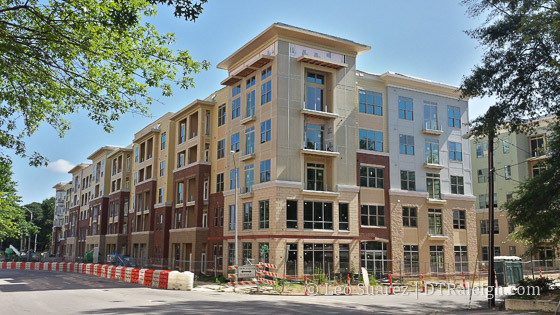 On Peace Street, you can see the apartments at Cameron Village. There may be more examples of this but I thought it was cool to kind of reflect on what downtown is also a part of. We follow what is happening in downtown but while out walking, it is nice to see (literally) the city we’re a part of taking shape around us. 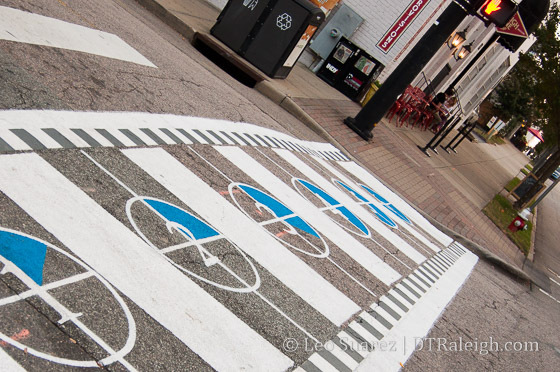 I feel like these are little details that make it special to be in downtown Raleigh. I thought this podcast from Charlotte Talks called “‘Ugly’ Development In Charlotte” was an interesting listen. The same exact thing is happening in Raleigh and for most conversations in the podcast, you could replace “Charlotte” with “Raleigh” and it would still apply. Listen to it on the Charlotte Talks website. I don’t know about you but I am actually pretty relieved that these two issues, downtown parking fees and the outdoor seating ordinance, are winding down. It’s amazing to see how simple issues like these really get the emotions flowing in people and create some bad press for our downtown. Let’s put these to bed. The above video has the council discussion. We recently talked about the proposed 7-day parking fee for the city-owned decks that was already approved and in the latest city budget. City staff also worked to come down on the hours of this fee to work with the concerned business owners. In the end, a pretty fair plan of implementing a flat $5 fee for Friday and Saturday night starting at 5pm would go into affect at the end of this year. To clarify, if someone comes into a deck before 5pm on Friday, they are subject to paying the same rate as before (pre-5pm hourly rates) and then if they leave after 5pm, they must pay the additional $5 fee. That closes the loophole of parking at 4:59pm and not paying anything. I asked David Meeker, a downtown business owner who worked with the city on these parking fees for his thoughts. “City Council realized businesses would be affected by the parking fees. They ended going further than the businesses wanted to go but not as far as staff wanted them to go. It’s a true compromise that will get the decks cleaned up without putting anyone out of business,” says Meeker. In the video, you can see the presentation that gives some thoughts about what we’ve learned after the 90-day trial of the new ordinance around private use of public space. 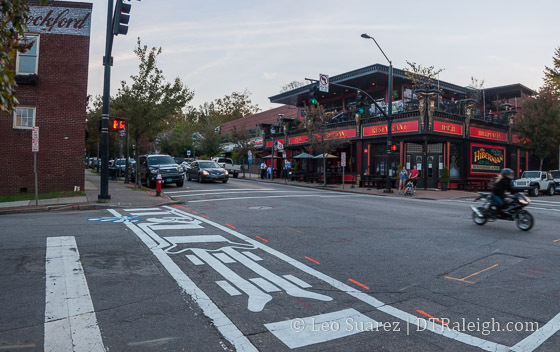 Reductions in overcrowding of sidewalks, pedestrian access issues, and enforcement issues were listed as some of the measurements for success with the new ordinance. When looking at a snapshot between this year and last, what are called “quality of life” issues were at a decrease. Issues like littering, alcohol violations, sleeping in public space were among the list. It wasn’t clear that the new ordinance was the cause but the way the presentation came out suggested that it could have been a factor. 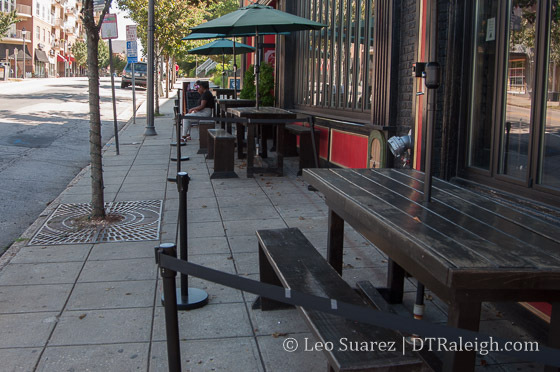 Change the Friday and Saturday night outdoor seating hours to end at 2am instead of the 1am during the trial. Sunday-Thursday would remain at 12am. Ask city staff to further look into the need for the one person per 15 square foot rule. Ask the Raleigh Appearance Commission to take a look at outdoor signage, stanchions, and furnishings to see if they can make a recommendation. Hire two more inspectors to participate in enforcement. I still don’t see the need for “roping in” (if you will) the outdoor seating on Sunday to Thursdays since there were no problems on these nights but perhaps that can be seen as a compromise. A lesson learned here is how important it is to communicate with our business community on any slight changes to permits. From the city’s point of view, it may seem like a good move to test a new change for 90 days but at the same time, you are tinkering with business revenue. I’m a huge supporter of doing things on a trial basis but this one resulted in tens of thousands of dollars lost, as reported by some businesses. Like I said earlier, I’m glad to move on from this topic but looking back, this was just not handled very well and a lack of communication was the main culprit in my opinion.